Cole: They left for love, and then love lost them. More pain, more joy than anyone can bear, and yet they embrace it. Solas: How could they not? 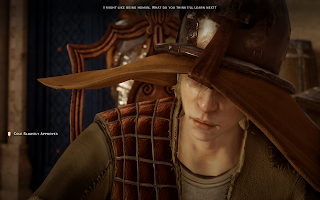 NOTE: As always, Spoilers for all of Dragon Age: Inquisition (as well as for a variety of movie endings)! YouTube Channel where he and Solas just review movies. Our quiet, haunted companion Cole is full of many secrets and mysteries, and one of those is that he seems to be able to see across the Fade at will. For those who pay close attention, his vision seems to extend across both time and space, both into the Bioware Mass Effect, Knights of the Old Republic, and Jade Empire game story universes, as well as beyond—even to present-day Earth itself. These moments, in which Cole discusses a multitude of movies from Earth with a delighted Solas, are among my favorite banters in the game, as almost all of them (in a lovely touch) are directly relevant to Cole and his supernatural aspect, and are about angels, ghosts or apparitions in some way. Even better, most of the references Cole and Solas make to movies also directly offer intriguing parallels or direct references to themselves or to their companions in the DAI universe. A few examples of some of my favorites, below, offer especially interesting potential insights. This is of course a reference to The Sixth Sense—but it's also, cleverly, referring to Cole himself, and his story in Asunder. It's literally the realization poor Cole had to survive at the end of the story. This is a reference to Fight Club, but it's also an apt and sly allusion to Blackwall (and perhaps, to The Iron Bull). Not only is Blackwall playing a role, becoming Blackwall in order to blot out the guilt and crime of his former self Thom Rainier, but it's an extremely apt look at Bull and the struggle within himself for dominance, between the loving, nurturing The Iron Bull and his ruthless, Qun-loyal Hissrad-self. This isn't just a clever reference to the classic film Soylent Green, but it also, terribly, alludes to the creation of Red Lyrium within DAI. A clever reference to The Lord of the Rings films that's also been tweaked for the observant to reference Michel de Chevin from The Masked Empire. Michel's crimes in The Masked Empire, honestly, make it very hard for me to save or support him in DAI no matter how heroically he's presented—in some ways I find his demon antagonist Imshael more forthright about himself and his motives than Michel himself (who has somehow managed to convince himself he is a hero, which, NO). Besides, Imshael is witty, and if he damns people, he does so only using their own weaknesses. Yeah, I admit it. I always have trouble killing Imshael in the game. He's just so funny! And he offers the standard villainous rewards of virgins, money, and power! (Please don't miss the chance to take him up on his offer, even just for fun, to witness his reactions—SAVE FIRST—because his response to your request for virgins is hilarious, and even more so if Cole is in your party.) Even at the end of the fight, Imshael is hilariously witty and rather touchingly disappointed in his own weakness. I don't know... Michel actively killed innocents and contributed to the deaths of countless elves (and pretty unrepentantly), so I struggle with the idea that a temptation demon like Imshael is the worst thing that this world can hold. At least he's honest about what he is. Michel is, I feel, still laboring under the idea that he's a hero. And he's not. "He was their enemy the whole time, but she made him forget, so he could change." This refers to the classic Bioware game Star Wars: Knights of the Old Republic, but to me it's also a slyly gorgeous allusion to Solas's secret and precarious situation (if romanced) in DAI. It's absolutely perfect if you look at it through Solas's lens in DAI—for a long time, after all, a romanced Inquisitor will in fact distract Solas from his purpose and will also, irrevocably, change him. He even notes and responds to this change, which is one of my favorite character notes in our prideful Dread Wolf—that he has the humility to note and to admit when he has been wrong. unself-aware? It's part of the tragedy of Solas. A lovely reference to the Geth, the terrifying yet poignant AI species from the Mass Effect series, but I also see parallels to Solas's struggle to see the people of present Thedas as real. This is a concept he's struggled against for a long time, for several reasons—first, because he's been so obsessed with his goal to restore the world he inadvertently damned that he, for a long time, refused to see Thedas's people as real. This was also the topic of specific and terribly sad dialogue with Felassan in The Masked Empire, as well as in key dialogues with Cole in DAI and again in its DLC, Trespasser. My own take has always been that, since his awakening, Solas is living his own private version of the timey-wimey DAI quest "In Hushed Whispers," viewing the current world as not quite real, as a mistake, a twisted and blunted reality that shouldn't exist at all (and won't, if he has his way). But then of course... he falls in love with the world, terrible as it is. And with the Inquisitor. And he cannot deny their reality or the monstrousness of what he's really seeking to accomplish. "An old name burns inside of armor that shouldn't fit, lit by faces of children he couldn't save." This is, I feel, a pretty direct allusion to Shepard in Mass Effect 3, but it's also an apt allusion, as well, to Bull, Cullen, Blackwall, and Solas in DAI. Each of those has witnessed (or authored) horrors that led to the unexpected deaths of children—children who could not be saved. Cole: It makes sense. It holds them as they die. But then it's a man, and he wants a woman. Why? Solas: When they possess people, they often indulge in feelings they have never before experienced. Cole: But it changed. It is blank, black, blunted from being. It never wanted before. 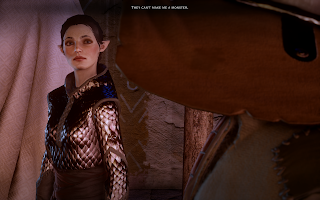 Solas: Have you felt no interest in women since you came through the Veil? To me, this isn't just a clever allusion to the underrated film Meet Joe Black, it's also a subtle allusion to a romanced Solas... who (after centuries in the Fade) has emerged to struggle with his own love and passion for a female Inquisitor. 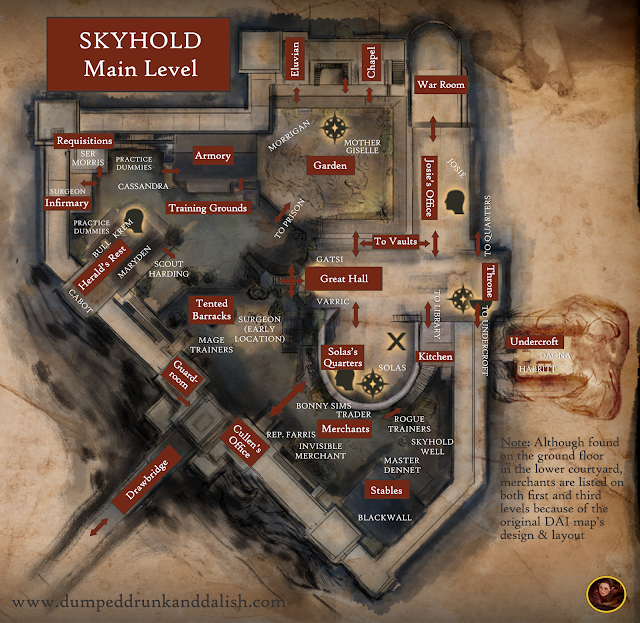 Cole: She wants a Chantry, but it does other things instead. 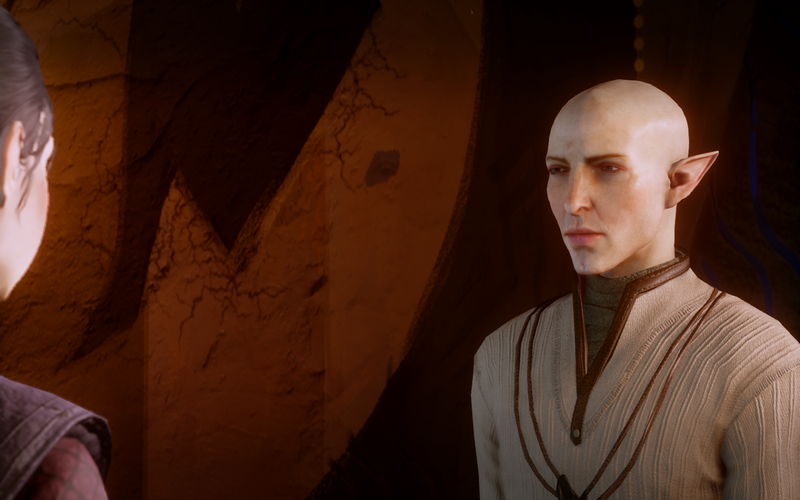 Solas: She did not need a Chantry, she needed to remember her faith. Cole: But it also spent time with her. It wanted to fall, feeling. Solas: They are always attracted to the world of the living. Cole: Why did it only talk facing one way? 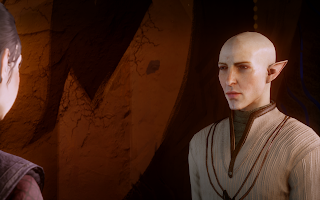 Solas: We all have a face we want to show, and a face we we do not. Let's talk about Solas's words here about faces: I feel very strongly that, among the revelations that may or may not follow in DA4 and the (hopeful) continuation of our story with Solas, one of those will, I'll bet, include the revelation that Solas himself is a shapeshifter in the Fade. This means that, to me, his allusions to his "other face" aren't just metaphorical, but factual. My own feeling is that Solas in the Fade can appear as the Dread Wolf (a magnificent wolf with the eyes of a Pride Demon, as depicted in his frescoes), as well as in the form of a sort of superpowered terrifying Pride Demon that's kind of a visible manifestation of his own id—the pride and arrogance that set him on this path. I also feel that, as implied through the game and game-novels, Solas has sometimes used these alter-egos in the Fade in order to accomplish tasks he himself might have found difficult to accomplish, such as the death of Felassan. they aren't even paying for WiFi... or HBO! Cole: It sees him ready to jump. Pain pounding, pulsing, life of frustration can finally fall, to freeze. Cole: It holds him high, shows the hole, where everything falls without him. He never needs to leave. He matters here. 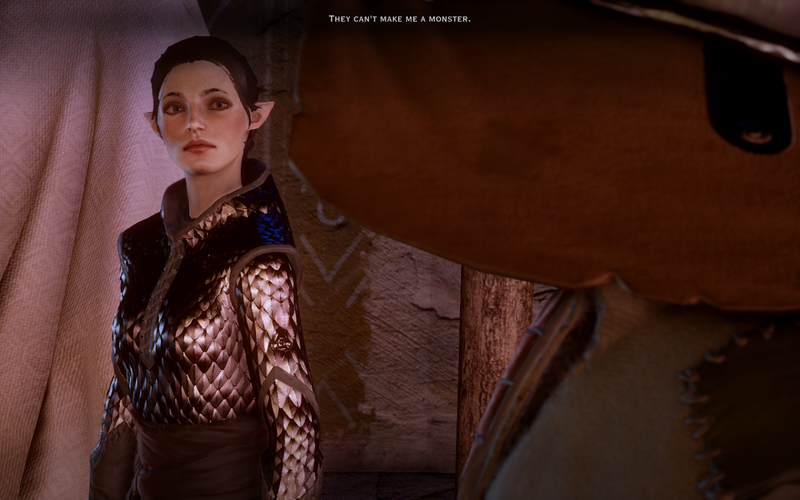 Solas: That is one interpretation, yes. Cole: You think it is different. Solas: I think he fell, and it held him as he died, leaving him with images that told him his life was worthwhile. Cole: That's much sadder. But yes. Calm, comfort, as the cold takes him away. Here's the thing: It's a Wonderful Life used to be one of my favorite movies, all the way through my twenties. I'm not kidding: I studied it in film school, owned copies of the screenplay and several critical analyses (including the "It's a Wonderful Life Book"), as well as viewing assorted commentaries and interviews. However, as I approached middle age, something weird happened, and I increasingly began to find it difficult to watch. I began to feel that there was a cruelty and masochism to George Bailey's journey, and to the dogged way life seems determined to strip him of each and every chance at even the smallest happiness (filled with wanderlust, poor George doesn't get to travel even once, or get the actual, much-deserved honeymoon trip he had planned and paid for). However, for this reason, I love the fact that Solas has always viewed this film's story as nothing more than one man's tragic story, and that even the film's darker final alternate-universe journey was actually nothing more than the final attempts of one hapless angel to comfort a dying man with the knowledge (illusion?) that his life mattered. I find it even more moving given the fact that Solas is so intensely lonely and haunted himself with his own actions—what would his own alternate-universe movie reel be like? What would he have done differently, if he could? Most of all, this particular reference moves me because it can be seen as alluding to the thing Solas fears most in the world (knowledge we gain when we visit the Fade in "Here Lies the Abyss"): Dying alone. No wonder Solas finds his dark reading of It's a Wonderful Life oddly comforting—in his view, George Bailey may die, but he doesn't die alone. He dies in the knowledge of his own rightness... and in the comfort of another. He did the right thing. And even if he dies... he does not do so alone. For this reason, my one request, my one hope, on DA4, is that Solas does not, in fact, die alone. I think he's doomed, although I do think he'll end up on the side of the Inquisitor and the angels, just in time, as he realizes the madness of his path. But then I think he'll die. I just hope he doesn't die alone. And I will of course also cling to the revelation that death may not be permanent for him. As he notes in Trespasser, "The first of my people do not die so easily." This is also why I fully expect to see my girl Flemeth back in DA4 (don't bother arguing la la la, I can't hear you...), as well. Again, this reference to City of Angels is another way in which Solas is looking at a film situation through a glass that is filled with yearning, sadness, and self-knowledge. If romanced, he himself is poised upon this very same precipice, even as (more importantly) he has fallen in love with Thedas—even the poisoned, corrupted version he found so horrifying upon awakening. This conversation is a reminder that Solas is walking his apocalyptic path with open eyes. He is aware that death, loss, sadness, and guilt lie ahead of him just as they lie behind him. But he will not pretend that the world is not beautiful, or that love is not worth risking all to experience. Last but not least, I love the idea that all these worlds are connected somehow by the Fade—it offers incredible possibilities if you're a fan of all of Bioware's gaming universes, and then it takes that extra step and adds in Earth as a common point of connection. It's intriguing and opens up a wealth of possibilities. Is Dragon Age happening at the same time as Mass Effect and these other game-universes? Or is it happening (even better) after them? Or does Cole's view encompass space and distance in such a way that even sequential time is utterly meaningless? Besides, I also can't help but adore the mental image of Solas occasionally taking time out of his intense and possibly nightmarish dreaming in the Fade across millennia after catastrophe, to nevertheless simply Netflix and chill like the rest of us. The thought of Solas solemnly and attentively bingewatching everything from It's a Wonderful Life to The Sixth Sense to Meet Joe Black, Angels in the Outfield, and dozens more makes me weirdly happy. I hope Solas's friend Wisdom or other spirits watched with him, at least, and provided lively debate on casting choices, story resolutions, and cinematography (for some reason, I keep picturing something similar to the ghostly/afterlife discussions of classic films that take place in Anthony Minghella's timeless Truly Madly Deeply: "Okay, everyone. Five Easy Pieces or Fitzcarraldo?"). SIDE NOTE: How can the magical, literate, and lovely Truly Madly Deeply be OUT OF PRINT? You can't even stream it! As it's one of the only movies I could, um, recite verbatim (don't judge me) this, folks, is another sign of the impending apocalypse. Solas: And that was our look at Blazing Saddles, an amusing look by Mel Brooks at racism and the American West. Cole: It made me sad. Solas: Oh, come! It was amusing and occasionally witty. Also, the musical sequences were fantastic. Cole (stubbornly): It was sad. Mongol just wanted love. Solas: Next up, we'll examine Inception. Cole: So many stairs! But they helped the boy, even if it was a lie. The helping was what mattered, not the lie. Solas: So true! And we'll also be taking a look at the classic film Blade Runner. Cole: He was one of them all the time. He didn't know! This has been a look at just a few of the DAI "movie banters"—there are many more, as noted in the Dragon Age Wiki here. What do you think? Do you agree or disagree? Do you perhaps see additional meanings in the banters that I may have missed here? I'd love your thoughts and input, as always! Images courtesy, as always, of Bioware.